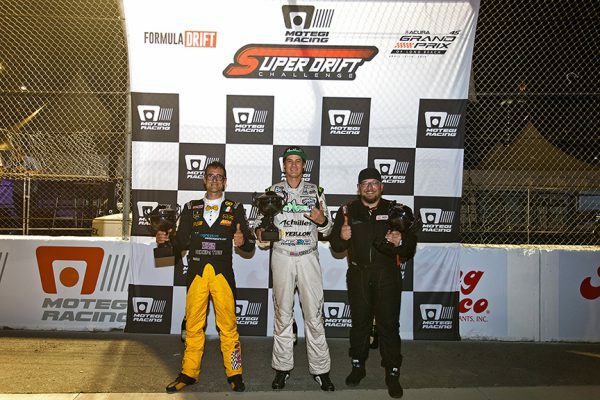 As an invitational event, Formula DRIFT drivers compete for honor, glory and a share of the $25000 prize money rather than Championship points, since Super DRIFT is not part of the official FD series. Taking place on Friday and Saturday evening, it remains incredibly popular and the drivers are greeted by excited fans in packed grandstands. 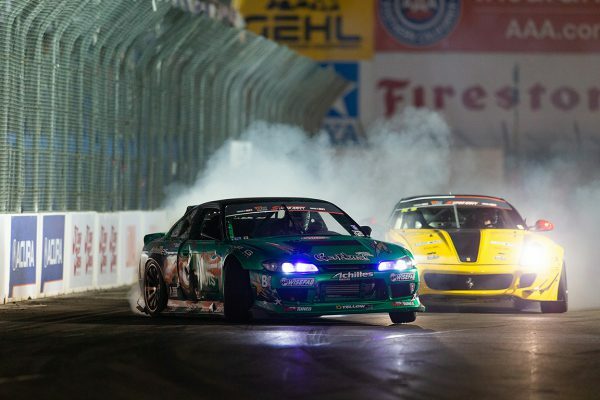 Coming off a strong second place at the 2019 Formula DRIFT on the Streets of Long Beach, Forrest Wang (USA) won both the Friday and Saturday events in his Achilles Tire / Yellowspeed Racing / NRG Innovations Nissan. On Friday night, he faced Kyle Mohan (USA) in the opening round of the Great 8. Mohan was driving his KMR / American Ethanol / Mazdatrix Mazda RX-8 and the local boy from Long Beach, CA had a lot of support in the grandstands. He got off to a good start when he pushed out to the first clipping point on his lead run but got offline in the outside zone and Wang’s momentum caused him to make slight contact. On the second run, Wang executed well while Mohan struggled to keep pace. With Mohan adjudged to have contributed to the collision on the first run, Wang took the win. In the Final 4, Wang was matched against Faruk Kugay (Poland) in the FK53 BMW M3. Kugay completed the Great 8 after rookie Joao Barion (Brazil) understeered his Barbarius / Achilles Tire Chevrolet Corvette C7 Z06 into the first turn and caused steering damage. Running against Wang, Kugay struggled to drift out to the walls on his lead run and couldn’t keep pace on the chase run, giving Wang the win. In the Final, Wang met Federico Sceriffo (Italy) in the FFF Drifting Department Ferrari 599 GTB Fiorano Drift Spec “Fiorella”. It was a similar story to his previous contests, where Wang was able to run deeper and get closer to his competitor on both runs. It gave the judges an easy decision and put Wang on the top step of the podium, with Sceriffo second and Kugay third. As Friday’s winner, Wang qualified for a bye run in the Great 8 and moved on to face Sceriffo’s Ferrari in the Final 4. This time around, the Italian driver committed harder to the course, running deeper lines and achieving closer proximity. However, he couldn’t match Wang’s execution and the judges gave the decision to the Nissan driver. 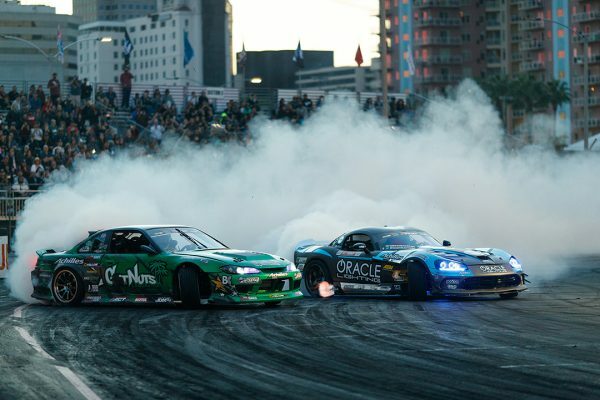 Moving into the Final, Wang was matched against Dean Kearney (Ireland) in the Oracle Lighting / Achilles Tire Dodge Viper. Finishing 15th in the opening round of the 2019 FD season, Kearney is a serious contender and would push Wang hard. On his lead run, Kearney drifted out to the walls in the first Touch & Go and Outside Zone, with Wang remaining close but unable to run as deep. In need of something special for his lead run, Wang was gifted the win when Kearney made a mistake in the final turn, forcing him to take a tighter line and making light contact with Wang’s car. Kearney had beaten Barion in the Great 8 and Mohan in the Final 4 to reach the final. 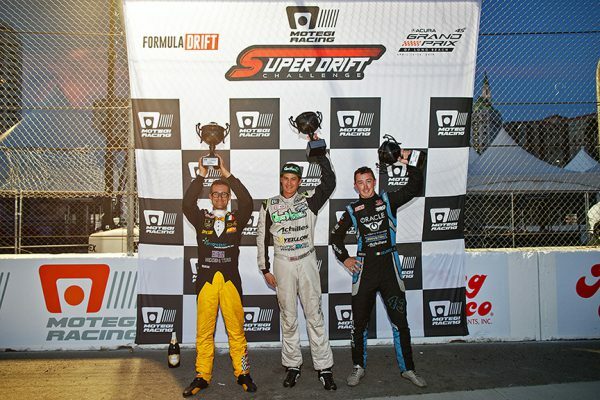 He took second place on the podium with Sceriffo in third.